Ontario Power Generation's (OPG) Thunder Bay Generating Station (TBGS) is now in service and is leading the electricity industry with an exciting new technology. The station has been converted to use advanced biomass, a renewable, clean and dispatchable fuel. Ontario’s Thunder Bay 150-megawatt generating station is now fully operational using clean-burning advanced biomass fuel – sawdust pellets from the province’s lumber industry. "Ontario is a leader in building a clean energy system, and the completion of the conversion to use advanced biomass at Thunder Bay is key to building a cleaner future for the people of our province," said Bob Chiarelli, Minister of Energy. "Congratulations to OPG for its commitment to this initiative and recognizing the long-term benefits cleaner electricity generation will bring to the people of Ontario." "Converting to advanced biomass is a positive step forward for the Northern Ontario economy. It keeps jobs at the Thunder Bay Generating Station and shows that our community and the Province of Ontario are world leaders in generating sustainable energy," said Michael Gravelle, MPP, Thunder Bay-Superior North. "As the local MPP for Thunder Bay-Atikokan, I am proud that our government converted both generating plants to clean biomass," said Bill Mauro. "These conversions are critical to Northwestern Ontario's energy security and provide an important tax base for local communities. The investments have also created new opportunities for the forestry industry while protecting local well-paying jobs." 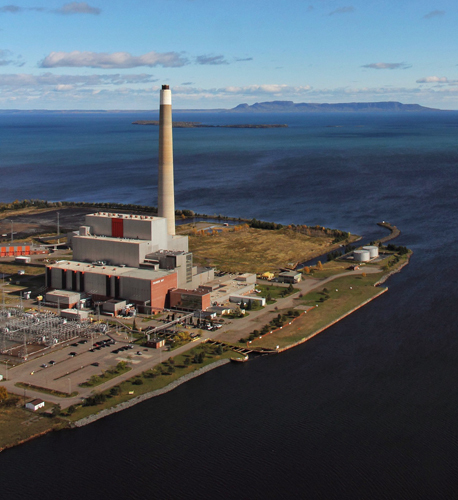 "By converting the Thunder Bay Generating Station to advanced biomass, Ontario has put Thunder Bay on the map as an innovative environmentally friendly city," said Mayor Keith Hobbs. "This conversion, along with the associated research program, aligns with the City's strategic priorities and efforts to further develop our knowledge-based economy, as well as putting the infrastructure in place to prepare for growth in the resource sector – a critical measure to advance Thunder Bay's economic diversification." Advanced biomass has handling and storage characteristics similar to those of coal, but contain about 75 per cent less nitrogen oxide than coal emissions and virtually no sulphur dioxide. The advanced biomass pellets used at TBGS are made from lumber mill sawdust. The conversion to advanced biomass puts Ontario on the leading edge of advanced biomass research worldwide. "Using advanced biomass to generate renewable electricity is a new area of development for the electricity industry," said OPG President and CEO Tom Mitchell. "OPG is pleased to be at the forefront of this exciting new and innovative technology." The conversion process developed for TBGS is leading edge. Bringing the plant into service is the beginning of advanced biomass-fuelled electricity in Ontario and North America. OPG is also supporting biomass research through its sponsorship of the OPG Bioenergy Learning Research Centre at Confederation College in Thunder Bay. Like OPG's Atikokan Generating Station, TBGS has the flexibility to respond to changes in electricity demand and provide dispatchable power when it is most required. Advanced biomass has handling and storage characteristics similar to those of coal. It contains about 75 per cent less nitrogen oxide than coal emissions and virtually no sulphur dioxide. 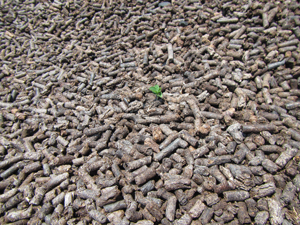 The advanced biomass pellets used at TBGS are made from lumber mill sawdust.